Compare features, performance and price with Taylor Made® Rossa putter priced at $165. Bionik Putters feature soft alloy inserts anodized for a striking new look. Amazing high mirror finish takes on the hue of the insert making each putter in the Bionik line unique. Alloy insert with milled face helps ensure optimal ball roll. Body is zinc with beautiful tin-nickel finish. The three line alignment system assures confidence in your putting stroke when lining up your putts. Perfect for golfers of all skill levels who are trying to shoot lower scores. 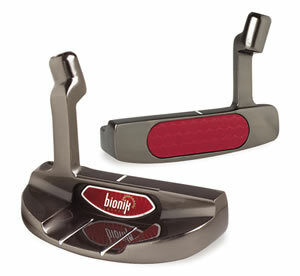 For more information about the Bionik 105 Red insert Putter, click here.